In Australia this summer, it’s one thing to have electricity, it’s quite another to be able to pay the bill. 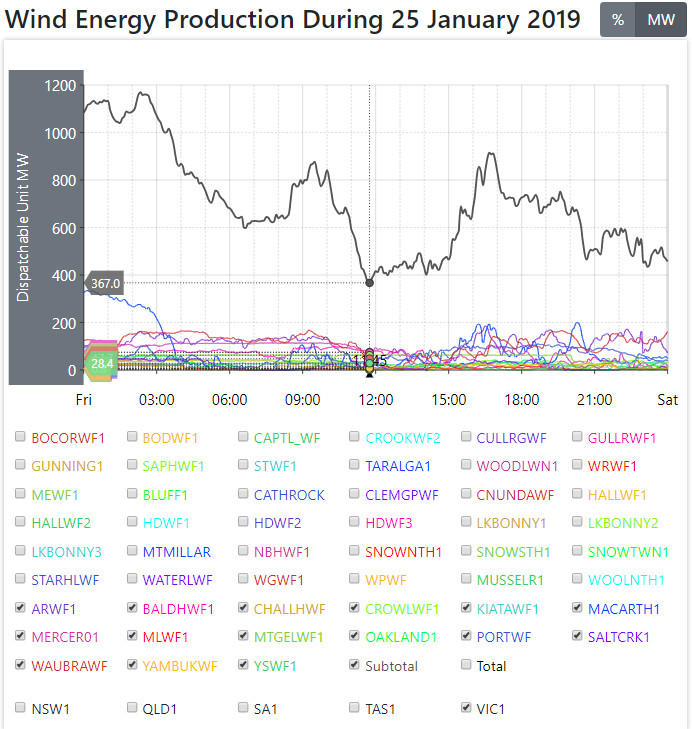 Over the last week or so, STT has focused on an event when 200,000 Victorian businesses and households were left sweltering during heatwave, as a collapse in wind power output led to widespread load shedding (ie controlled blackouts). Step back and think about the concept a little more broadly, and the economic insanity reveals itself: because Australia cannot supply enough electricity to consumers, Australian power consumers are paying productive businesses to stop using it. Result? Businesses stop producing whatever it was they might be producing, if they had electricity, in the first place. As an economic ‘policy’, it makes robbing Peter to pay Paul sound positively canny. During heatwaves, when wind power output collapses and/or the sun sets, the owners of fast-start peaking plants (highly inefficient and fuel hungry diesel generators, Open Cycle Gas Turbines and the like) are able to extort staggering amounts for the power they produce, which suddenly becomes essential to keeping the grid from completely collapsing. 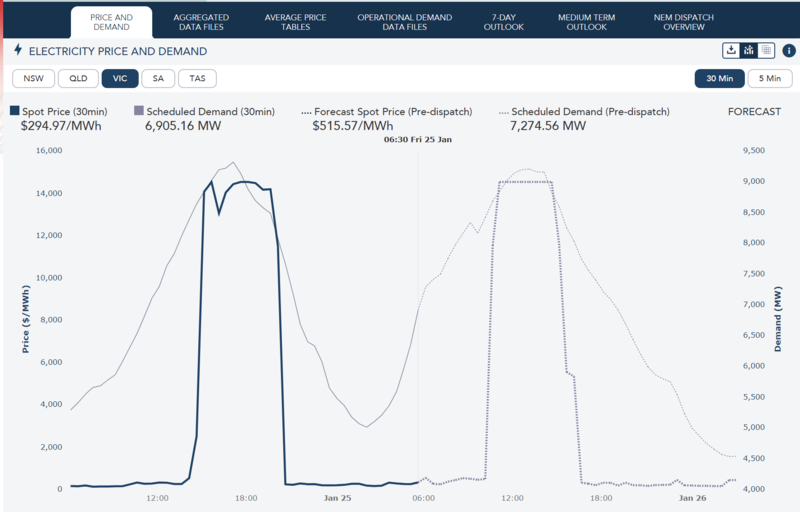 The cost of ‘demand management’ and paying peaking plant operators anything up to $14,500 per MWh for power that a coal-fired plant can deliver for $50 – the inevitable consequence of output collapses around sunset and the weather – adds up. And, as is always the case with the subsidy-soaked renewables scam, it’s power consumers that foot the bill. Victoria and South Australia copped a combined $1.1 billion energy cost hit in less than 48 hours last week as extreme weather conditions delivered windfall gains to energy generators and drove upward pressure on power prices for households and businesses. An analysis of energy demand and spot-market prices reveals the effective power bill last Thursday for South Australia and Victoria hit $944 million, with high prices into Friday adding a further $178m to the cost of the event. Energy experts told The Australian that 20-year high average spot prices of more than $3300/MWh, which shot to $14,500/MWh for about five hours, would ultimately be passed onto energy users as generators and retailers negotiated new contracts and hedging arrangements. Resources Minister Matt Canavan said the massive price spike in the southern states, caused by soaring heat and windless conditions, bolstered the case for government support for new “firm” power sources, under its new underwriting scheme. As energy buyers count the costs of the event, which plunged 200,000 Victorian homes into darkness, Victorian Energy Policy Centre director Bruce Mountain warned consumers “will pay in the longer term” for the power price spike. “When retailers need to contract, the generators know they will be petrified, and they are more likely to achieve higher prices than they otherwise would,” he said. Dr Mountain said some generators would have “made a motza” from the event, but many would have been unable to cash-in as their capacity would have been fully contracted at lower prices. The secrecy and complexity of energy contracts, which were hedged to guard against the impact of extreme events, made it almost impossible to identify the winners and losers, Grattan Institute energy program director Tony Wood said. “The generators, some of them will have made a lot of money out of this,” he said. Energy consultancy Watt­Clarity said there was “large amounts of money changing hands in the spot market” on Thursday and Friday as retailers scrambled for capacity and generators sought to cash in. “At the end of the day, however, no matter which generators ­pocket the cash, it will be the energy user collectively who ends up footing the bill,” WattClarity analyst Paul McArdle said. Energy users will also foot the bill for the buyback of power from industrial users, after the market operator AEMO invoked its Reliability and Emergency Reserve Trader powers. Last year, the bill hit $50m as a result of two RERT events. “The RERT mechanism invoked by AEMO will have incurred significant costs which electricity users are likely to see on their bills in coming months, as happened in early 2018,” Australian Industry Group chief executive Innes Willox said. Brisbane-based trader EnergyEdge said the combined spot electricity bill for South Australia and Victoria accounted for 15.6 per cent of the states’ annual costs. “These types of market signals drive new capacity investment in dispatchable technologies such as batteries, Snowy 2.0 and fast-start gas generators,” it said. AEMO spokesman Stuart Allott said the market operator had warned of the possibility of an event such as Friday’s load shedding in its summer readiness plan, published in November. 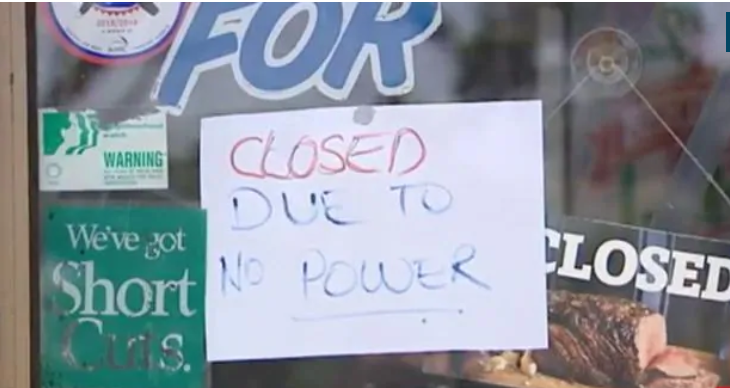 On Friday, Victoria’s Energy Minister Lily D’Ambrosio claimed blackouts were not even “a possibility” just 90 minutes before the load shedding began. Set out above is the NEM pricing for power on 24 January: spot the difference in the prices paid in wind powered SA and Victoria, versus coal-powered QLD and NSW. Below is the spot price paid in Victoria on 25 January, the day they couldn’t keep the lights and ACs on. Now, here’s Graham Lloyd detailing a little of the above. It is the billion-dollar question that won’t go away: why do states with the most “cheapest” sources of energy, wind and solar, have the highest electricity prices? 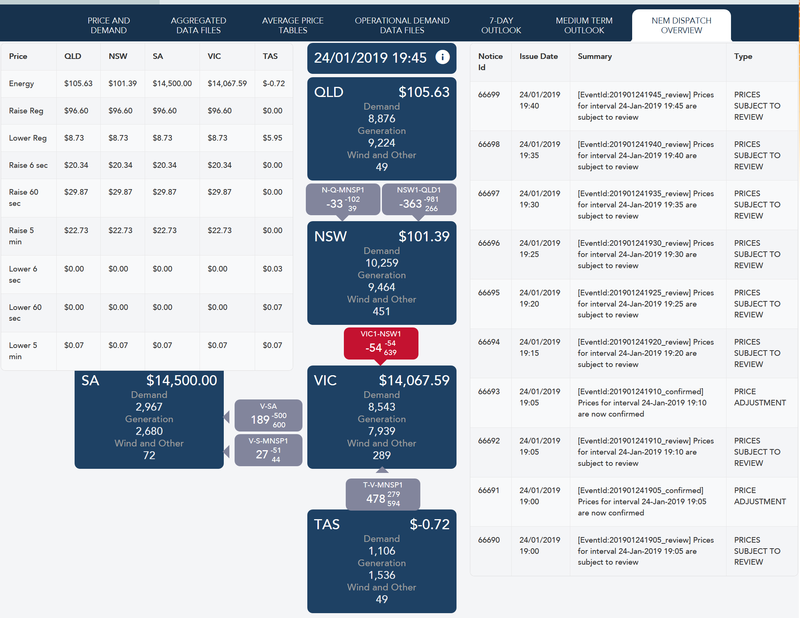 When the spot electricity price maxed out at the $14,500-a-megawatt hour limit in Victoria last week, Queenslanders were paying $105.63 and NSW $109. Wind capital South Australia was paying $9666.67. The short answer is that following the closure of coal-fired power plants in Victoria and South Australia, while NSW and Queensland had a supply and demand balance for electricity, the southern states were in deficit. At 4.50pm on January 24, with a demand of 9221MW in Victoria, renewables were supplying 595MW from a total wind power capacity of 1740MW. In South Australia from a demand of 2954MW, wind and solar were contributing 303MW from a total wind power capacity of 1929MW. Planned and unplanned withdrawal of some coal-fired capacity at peak demand did not help. But it is a snapshot of the disaster that wishful thinking has been unable to avoid. Australian Energy Market Operator advice that there would be sufficient generation to supply maximum demand for the 2018-19 summer measured against the NEM’s reliability standard proved incorrect. Last week’s supply squeeze eventually will be felt by consumers in Victoria and South Australia, but calculating the cost burden is not as simple as it might seem. Some estimates have put the cost as high as $930 million for two days last week. Under the bidding rules of the national electricity market, all generators theoretically receive the highest accepted price. But the big energy players have ways to lessen the impact. AEMO says the spot market does not reflect costs that retailers or market customers actually pay, due to hedging arrangements. Most retailers in the NEM have hedges in place where they have locked in their cost for a fixed volume of energy at an agreed price to provide shelter from extremes in the pool price. Most generators will have sold energy at an agreed price and may not benefit from the high spot market. But everything will come at a cost. Asking industry to stop using power is expensive, and capacity markets in which generators agree to be available for times of high demand have proved costly in other countries where they have been used. Unless the market is brought back into balance, the cost of hedging will become more expensive still. Users will always foot the bill. Renewable energy might be the cheapest option to build but it makes sense only if there is power available when it is needed. This is the most insightful website on the internet. Thank you for the telling the truth. Keep up the great work. Imagine paying $944,000,000 for a days supply of electricity, given three days at this price you could build a large base load coal fired power station and start to fix the problem. But we all know how smart Australians are it’s on our car number plates courtesy of the smart state governments. For average Australians consuming electricity is a bit like buying a new car every day to go to work in because you cannot afford the petrol. Please don’t build anymore coal fired power stations this Truman adventure into the electricity abyss courtesy of the greatest bunch of Morons to ever walk the planet might help future generations of Australians to vote for people who never go to university. The film Idiocracy has been mentioned before, but having recently watched Michael Moore’s Fahrenheit 11/9, to believe the world wide insanity of moving to RE to save the planet from past human stupidity isn’t being directed by those of greed like carbon traders (David) Blood & (Al) Gore along with the Malthusian ‘overpopulationists’ such as Prince Philip & the green movement since the pre 1950s, in addition to a one world financial controlling dictatorship, it’s just a bit too real to be ignored. Greenies are too logically confused to be reasoned with, as they place all existing species on the same level as wilfully creative mankind which is entirely ridiculous. Then by following the socially cohesive family unit back to Malthus’ time through the Congress of Cultural Freedom, & the political correctness manipulation to today’s divide & conquer techniques administered on local levels, the direction of reality no longer indicates those at the top of social control have no idea what they are doing. The rest of course will go along with the other blithering idiots without seeing or understanding the overall picture, including the populist party politicians. It was about ‘global warming’ yet because of the inconsistencies it’s now ‘climate change’ but the RE onslaught continues right, wrong or illogical. That these social destroyers, bigots & racists continue such an unreasonable agenda, always have a major problem when asked who exactly are you saving the planet for? The reply can usually be interpreted as being for a reduced minority of supposedly equal life forms. As was pointed out in Moore’s film, take a look at what happened in Flint, Michigan USA with the water poisoning in 2018. Is it any wonder that terrorist legislation is directed at controlling local populations & was started to be put in place in conjunction with the RE push in IMF controlled countries? Just hope the ‘yellow vest’ & BS youth movements can keep growing. In the meantime, ask your local pollie if they have their own backup electric generator. If they do then they’re a doomsday prepper who don’t care about constituents. Then ask them what they think society is for?